Disclaimer: Michael is an Agile coach colleague and friend that I've known since Agile Coach Camp 2010.I had downloaded the free PDF and started reading it; Michael then gave me a paper copy at a retreat we both attended prior to Agile Coach Camp 2012. I really enjoyed this concise book; it's best quality is it helps you get a feel of the cultural changes you will be making as you approach Agile change. he makes the distinction in this change: adoption is merely trying to put practices in place and transformation is changing mindsets. The hypothesis is that the latter achieves the high benefits of agility, while the former only has small marginal returns. The latter is cultural change; the former is getting a few practices in place and missing synergies between business units, teams, and even the practices themselves. My observations agree with this view, but Michael's presentation if it deepened my understanding in how to approach this transformation.An immensely helpful part of the book is the parts it references for more in depth reading rather than inflating the book size by repeating that content. I personally appreciate this immensely as for areas I already understood, I didn't have to read through it to dig out the nuggets of wisdom Michael was putting forth. His book approach made then explicit. I highly recommend this book to all Agile coaches or others interested in organizational transformation (with an IT bias). In just 80 pages Michael presents his take on agile transformations and adoptions and the current state of those in our industry.I like many things about this book:Most importantly, I think he may have done our industry a great favor! Writing about the complexity of this issue in a short and very accessible way may be one step for many towards moving out of "Unconscious incompetence" on this subject.For me, his approach using organizational culture and Schein's model as the primary indicator of what might work in a specific case was interesting. Since culture is often cited as an impediment to agile transformations, this sounds like an important perspective.Also, coverage of other tools will serve as a teaser and enlightenment for aspiring change agents, showing the complexity of it all and accelerating their journey towards being able to assist their organizations effectively.And the end of the book is awesome. It contains alternate opinions from some people. Directly commenting on both core and minor ideas in Michael's book. It this section he certainly leads by example, personifying the quest for learning, communicating and being open to alternate interpretations of reality. This is the sort of behavior that we would like to see in transformed "agile" organizations. I cannot remember seeing this in an "agile" book before though... Nice work Michael!One minor point I seem to think differently about is the use of inspect and adapt as enterprise transition strategy. It seems Michael see's the enterprise transition backlog as a static list, "the requirements" to implemented. Thus he concludes this can only be used for simple cases. A correct inference based on that assumption. However, using a backlog this way is not in the spirit of Scrum nor agile. Having a dynamic list of issues to investigate or assumptions to validate and from time to time refocusing efforts by following these up and aligning the updated list with the goals of the transformation would be very compatible with complexity in my view. All in all, thanks for a great and very important book Michael. 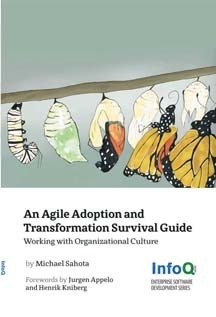 This afternoon I read Michael Sahota's book An Agile Adoption and Transformation Survival Guide: Working With Organizational Culture (which you can download for free from InfoQ. )It's short and I read through it in about an hour. In it Michael addresses the context teams at work operate in; organisational culture. The premise is that agile adoptions are a dead end unless you tap into the cultural context. There is an opening discussion that addresses the Do Agile v Be Agile paradigm, acknowledging the agile community discussions which have gone before, and then settling in with the fundamental premise of the book; most people want to do agile and don't want to be agile.Culture change is hard, and often those in power don't want to pay the cost. Often in fact, it isn't needed. And when your client only wants agile practices you get a whole range of options to play with that are useful, valuable, and worthy. But not as hard.Michael applies a model which looks at culture across two dimensions; people v company orientation and reality v possibility orientation. By understanding where you client is, you are better able to talk about where they want to go. Even better, you have Kanban and Software Craftmanship to address cultures that aren't ready to adopt an agile spirit.I am familiar with culture change programs, and with working in a team culture in conflict with organisational culture, and I don't think culture change is impossible. I do think it takes a concerted effort though, and you'll need to try a few things out before you really find the right path.Michael seems to come to the conclusion that usually it's a waste of time to try to shift culture, but practices that suit the dominant culture can be found, and applied in useful ways. I'm not sold on this, but I understand it, so to that end, I find this book a step on a communal journey rather than a final statement on culture change for agile teams and consultants.It is easy to read, the ideas are presented in simple and accessible ways, and it is a very worthy topic. If you are in the business of change at any scale I highly recommend you invest a few mouse clicks and some reading time. Concise and illustrative. Through few models, like Schneider's cultural model Michael explains the agile culture belonging to the areas of collaboration and cultivation. He further describes how to build a shield or organizational adapters towards the rest (hostile) of organization. Warmly recommended reading! Although I'm no change agent for agile methods, this book does tell a cautionary tale about what it takes to really transform to agile, or adopt some of its practices depending on the current organization culture. Liked how brief and to the point the book was. Disliked some of the hand drawn diagrams which were a bit too hard to read and comprehend. During this book you would realise what is the number one issue with Agile fail in adopting or transforming.Michael shows different tools to help with transforming companies to Agile.I strongly recommend to read this book. Very useful to start thinking beyond the agile adoption/transformation mindset "We are damn right and you will have to accept our suggestions because we are cool and agile". Very good thoughts and explanations. This short, compact book is helping me a lot with my current situation in my company. Great book to make you think about context and culture in order to select any tool, framework or method for a team and product. Great mini-book! Must read for an agile coach, scrum master or any manager supporting change. Useful aggregation book, easy to read with clear references.